Thanks Tom [Sefton] your card from Durango, Colorado - don't blame you for staying over for a week : 'THERE'S STILL GOLD IN THEM THAR HILLS'!!!! Pick out a couple of nuggets for me (nobody'll be any the wiser)!! Am sure you're having a wonderful time. Again regards & bestest to you all. 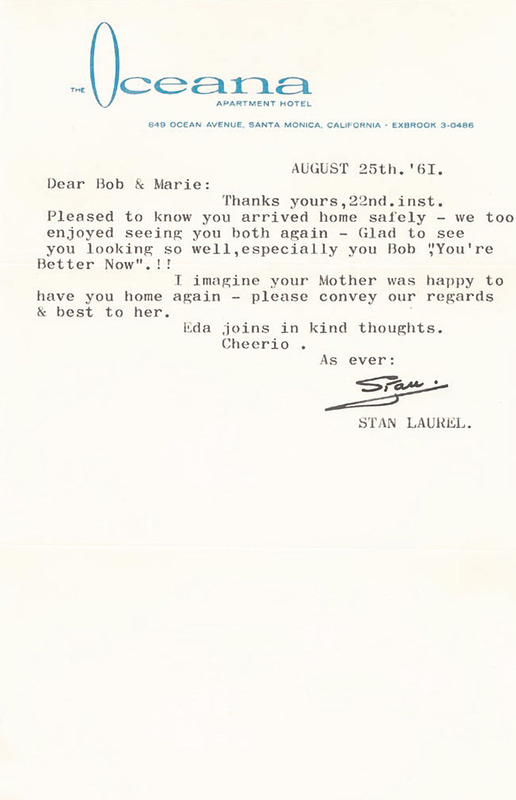 Pleased to know the old Laurel & Hardy films afforded you so much pleasure & I appreciate your kind sentiments. The articles you read in the papers regarding my appearing again on Television. These new films of L&H will appear in the form of Animated Cartoons. Thank you for the enquiry, & kindly interest. Thanks your letter 10th.inst. 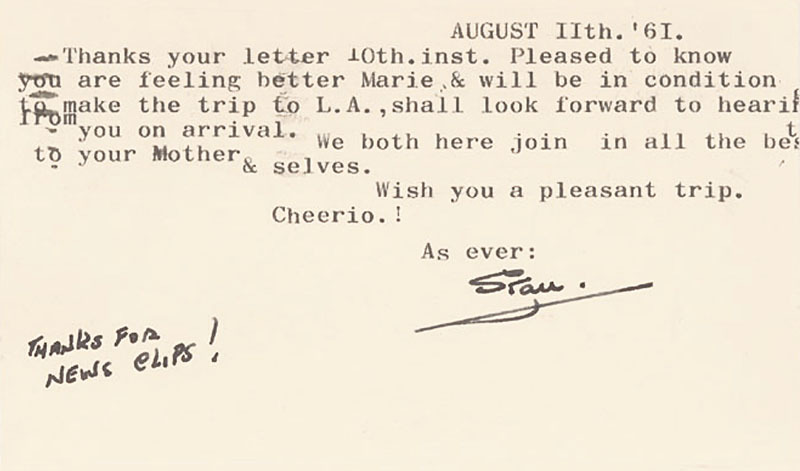 Pleased to know you are feeling better Marie [Hatfield] & will be in condition to make the trip to L.A., shall look forward to hearing from you on arrival. We both here join in all the best to your Mother & selves. Wish you a pleasant trip. Thanks Gary [Arnold] for the card - WELCOME HOME! I recd. your card en route your vacation, am sure you enjoyed your interesting trip. Everything here is as usual, so not much news to tell you. My regards & best to self & Family, wish you all continued good health & happiness. Thanks yours, 17th.inst. with enclosure of addressed labels. As soon as the books arrive I will autograph & ship right away. Strange no news from Vanessa Brown - I'll check with Ben Shipman (my attorney) will advise you later - I think Ben has her home address. Incidently, speaking of Ben, please convey my regards & best to Ben Chadwell. Not much new to tell you - so bye for now. Thanks Dean [Kaner] for your nice letter - glad you enjoyed the film "Laughs & Thrills of Yesterday",. Your visit to the tallest Building in Minneapolis must have been very interesting to you. Not much to tell you, so bye for now. Again my best wishes to yourself & family. Thanks your letter in regard to making copies of the L&H 'Still' pictures from our old films - as I understand the situation, those photos were the property of the Hal Roach studios & were not permitted to be copied for commercial purpose - in your case I do'nt feel you are involved in any way. Thanks for the kind enquiry - much appreciated. Pleased to know you arrived home safely - we too enjoyed seeing you both again - Glad to see you looking so well, especially you Bob, "You're Better Now".!! I imagine your Mother was happy to have you home again - please convey our regards & best to her. Eda joins in kind thoughts. Books arrived this AM. have just mailed them to the parties requested (autographed.) & of course the extra one for you. I mailed them 4th.class, so may be longer in transit. Again thanks Tom. Trust alls well. Thanks your card from Douglas,I.O.M. Am disturbed to note that your Grandpa Jackie is seriously ill - sincerely hope its not a critical situation - wish him speedy recovery - please convey my love & best to him. Glad you're enjoying your holiday on the I.O.M. & alls well & happy. My love & best to your dear self & family. I.O.M. refers to the Isle of Man, of which Douglas is its capital city. The Isle of Man is a self-governing British Crown dependency, located in the Irish Sea at the geographical centre of the British Isles. Thanks your nice letter. 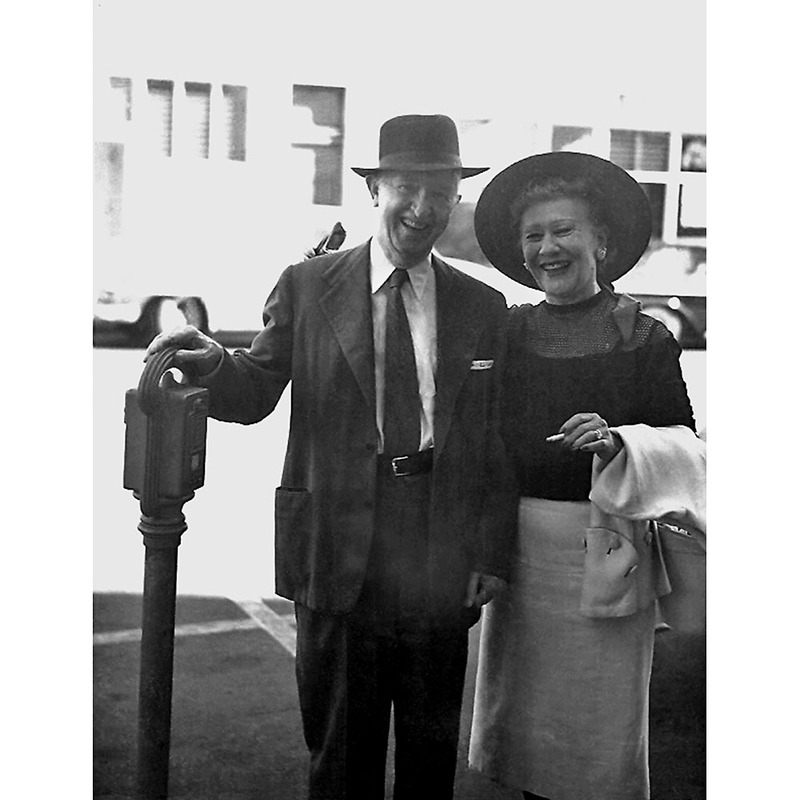 Mrs Hardy's address is 12416, Weddington Street, North Hollywood. She recently re-married, her name now is Mrs Ben Price. I too enjoyed the pleasure of meeting you & your Brother Glen. My regards & best to you both.